Looks like someone is having a pig day!!! A quick "git 'er done" card using an image from Simon Says Stamp. No glitter, sequins, or enamel dots........just paper, image, and a sentiment. I did add some Glossy Accents to the balloon - that's why it's all motley looking. I still haven't figured out how to get a good picture when glossy accents are involved. That's going to do it for today. I really wish I could tell you what I did on this card - but since it was done a couple of weeks ago, I won't swear to anything. I seem to be in one of my funks and just not in the mood to craft right now. I really need a lightening bolt of inspiration to hit me on top of the head or something. I remember I did this after seeing a video on someones blog.....pretty much of a toss up on where I saw it though. I stamped the star background in Versamark then sponged some ink over the stars making it a darker blue on top and fading down to the bottom. The stars resisted the ink and this left me with the blue background. I think that was all there was to it. The sentiment was stamped on a piece of vellum, heat embossed, and then cut out using a die from Memory Box. I added the two sequins (to cover up where I glued the vellum down) and then remembered I had some bluish colored star gems. Added a couple of those and called it done. 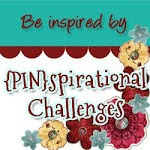 There's a new and improved challenge blog starting next week - Wednesday September. I'm so excited to share that I'll be a part of this new team. The Scrapy Land Challenge Blog will have bi-weekly challenges and will be centered around using one or more dies that the Scrapy Land STORE carries - which by the way, carries over FORTY different brands! So many dies to choose from. 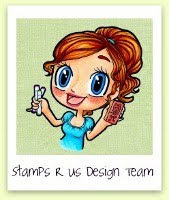 They also have stamps, Copics, and all kinds of supplies for your card making needs - AND absolutely wonderful prices!!! 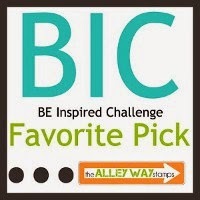 So be thinking about what you can make for our first challenge and just use one of the dies that's carried in the store. 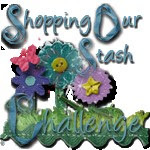 The challenges will be on the first and third Wednesday of each month and the Winner of each challenge will receive a gift certificate to shop at Scrapy Land. 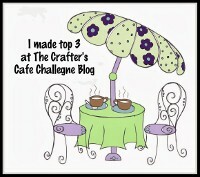 Head on over to the Scrapy Land Challenge Blog to meet the other amazingly talented women and say hi. Be sure to mark your calendars for Sept 3 and join us as we kick off these fun challenges and your chance to win a gift certificate to the store! 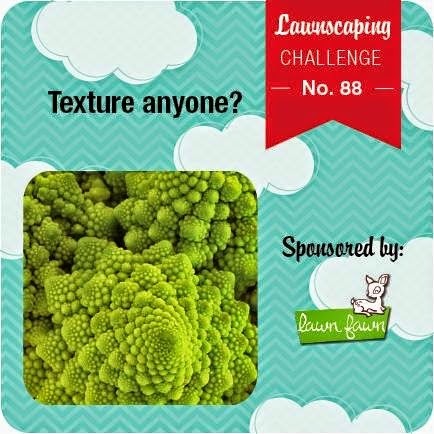 It's all about texture over at the Lawnscaping Challenge so I'll enter this in their challenge. 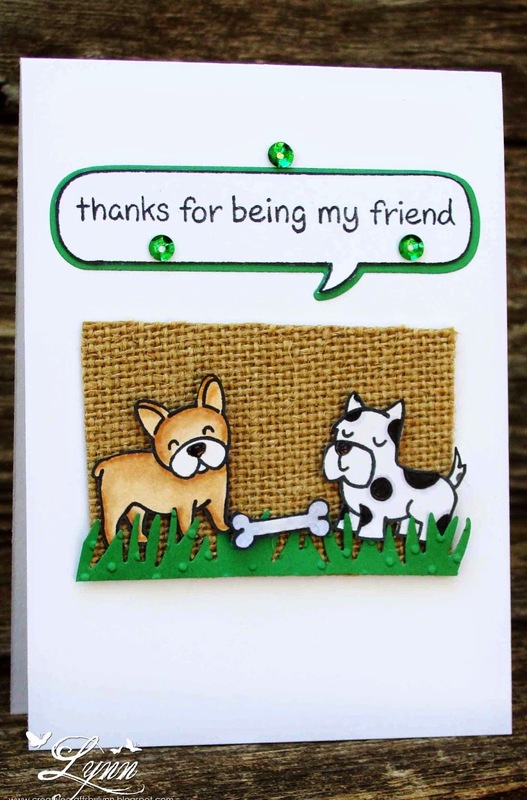 I used a piece of burlap for the backing and then added a couple of those cute little pups and a bone from Critters in the Dog Park (Lawn Fawn). 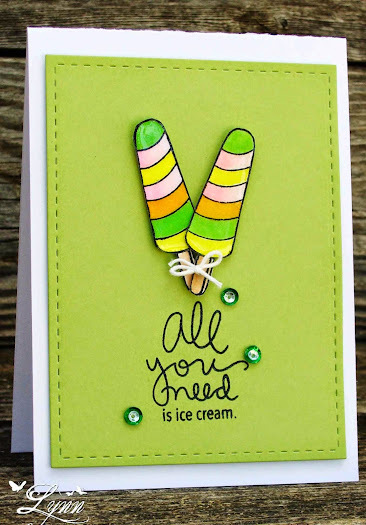 The grass die is also from Lawn Fawn and I embossed it with the Swiss Dots embossing folder. The sentiment was completed using the stamps and dies from A Birdie Told Me then several sequins added. I'll also enter this in the challenge at Pixie's Crafty Workshop (snippets) where I'm really hoping they still let me in the gates there. Up until about 4 years ago he was wearing the same size jeans as he did in high school! Really! As we all know, the older we get the more things seem to spread or shift or whatever. (Although I personally just think I'm getting shorter!!) Of course about that same time he decided that a bowl of ice cream before going to bed every night was exactly what the body needed. After numerous scoops he found that the jeans were (and still are) getting a wee bit snug.....well DUH! So I decided to get some of that no fat frozen yogurt and give him that instead. He won't eat the stuff because as he says the word "yogurt" is just nasty! The word "ice cream" sounds so much better. LOL! The jeans are still getting bigger and the ice cream is still going into the bowl every night. Might as well be happy I guess! 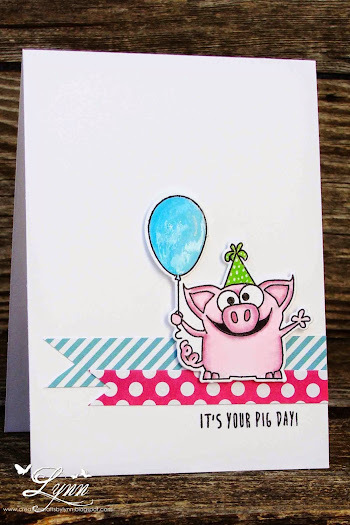 The first card was sent to my granddaughter for her birthday. 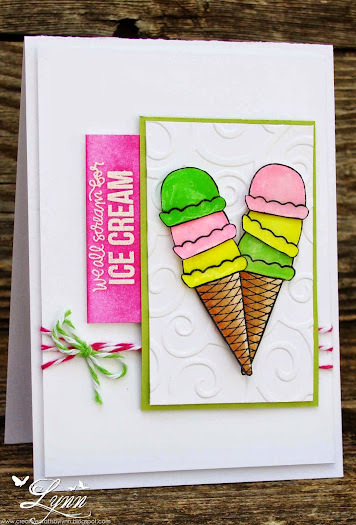 The second card is going to sit beside that next bowl of ice cream Jim has! 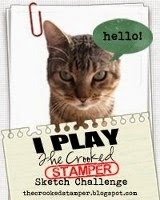 The stamp set I used is from Simon Says Stamp. 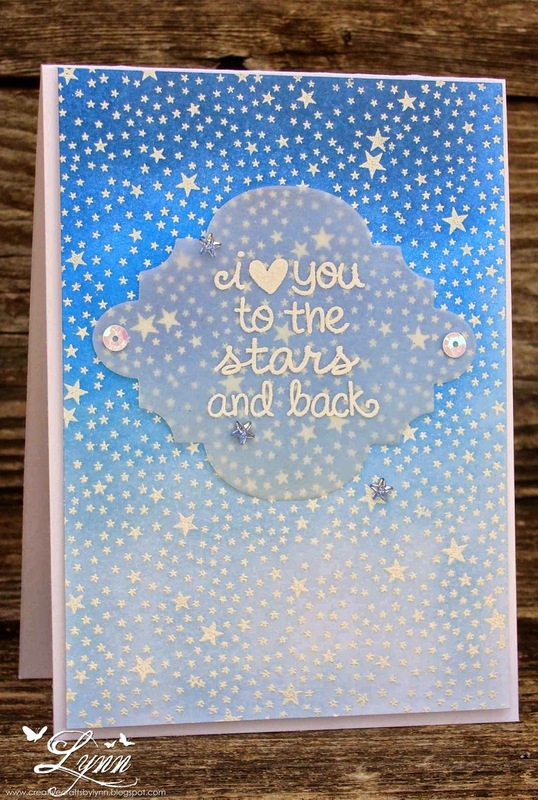 Lots of Glossy Accents added, a little heat embossing in white, dry embossing, several sequins, and a bit of twine. I'm still trying to get back in the groove of things around here after being gone for several days. I love going, but it sure is hard to catch up on things once I'm back home again. On a happy note though - Jim did get the dishes washed before I got home.......probably about 30 minutes before I opened the door! 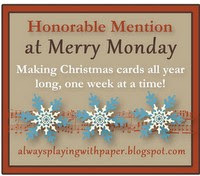 It's (past) time to start thinking about Christmas cards and this one was a real quickie. Nothing fancy at all but it's going to be a very easy mailer for sure. 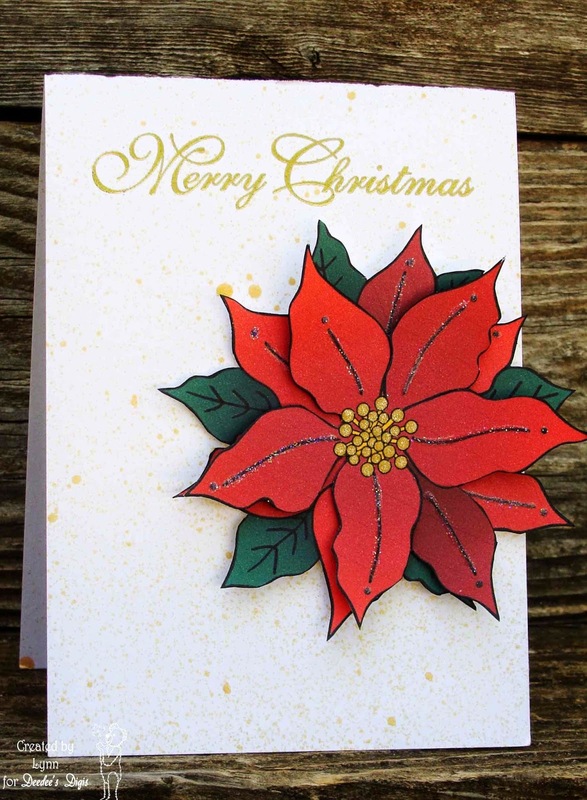 The poinsettia is from Deedee's Digi's and it's a beauty. This is the pre-colored image but when you get this, you will also receive the line version so you can color it yourself. Also included in the set (called Beauty of the Season) are beautiful sentiments. 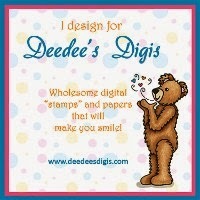 Check out Deedee's Digis store for all her wonderful images. 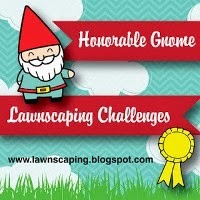 Also, we have a progressive challenge going on each month and we'd love for you to join us. 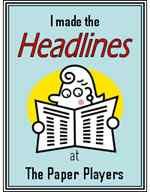 All the information can be found at Deedee's Digi's. 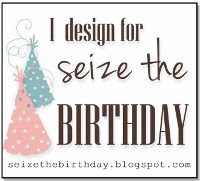 This month is a celebration month so think prizes too! I printed out the image twice and then fussy cut and stacked them on top of each other. Some gold Wink of Stella was added to the berries. The sentiment was heat embossed with gold embossing powder. The background was sprayed with some Hero Arts gold Metallic Shimmer. We have a brand new challenge beginning today at Tuesday Throwdown!! Our theme for this week is Furry Friends. 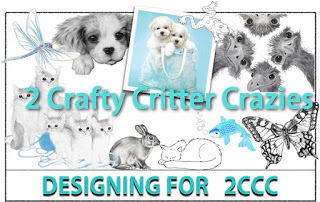 We're being sponsored by Oak Pond creations who also provided the images for the DT to use. 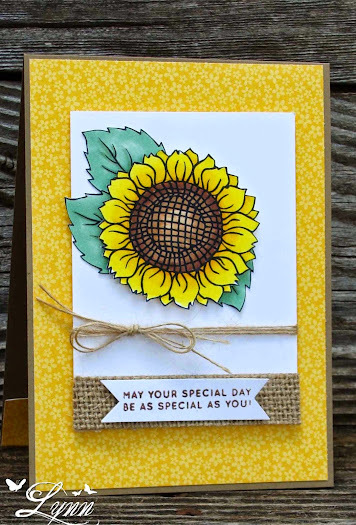 Be sure and head on over to Tuesday Throwdown and see all the wonderful inspiration from the DT and then enter for your chance to win a great prize package from Oak Pond! 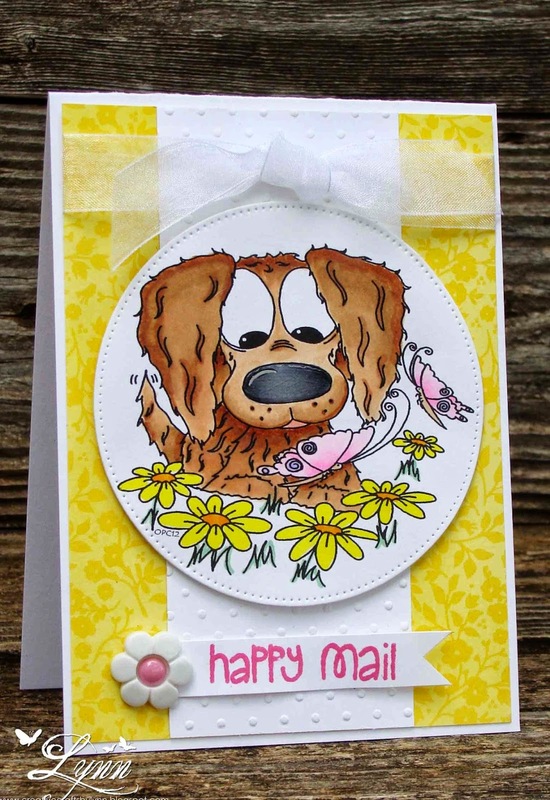 Of course I just had to use one of the cute little puppy images since I do love those four legged critters! This one looks like he's almost getting dizzy trying to see that butterflies and flowers. This card will hopefully put a smile on someones face. 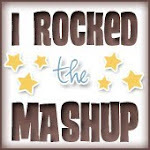 Thanks for stopping by..........and check out Tuesday Throwdown now! Thought I'd throw out a little sweetness today! A quick card using a Pure Innocence stamp. 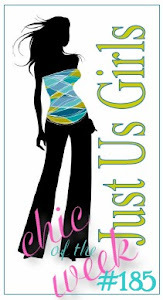 This is not an example of me when I was a little girl.......No one would have ever, ever accused me of being innocent of anything - but I DID have fun and guess I turned out ok. In the morning I'll be scooting out of town for a few days but will see everyone again on Wednesday. 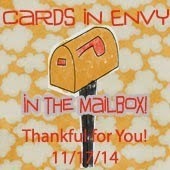 I do have a card scheduled for Tuesday though so stop in if you get a chance. Jim and Rambo will be holding down the fort here and I think they get very excited when I leave because they know that can be as messy as they want. Rambo actually doesn't dirty up too many dishes. As long as he has his water and food bowl he's good to go. Jim, on the other hand, is an entirely different story! 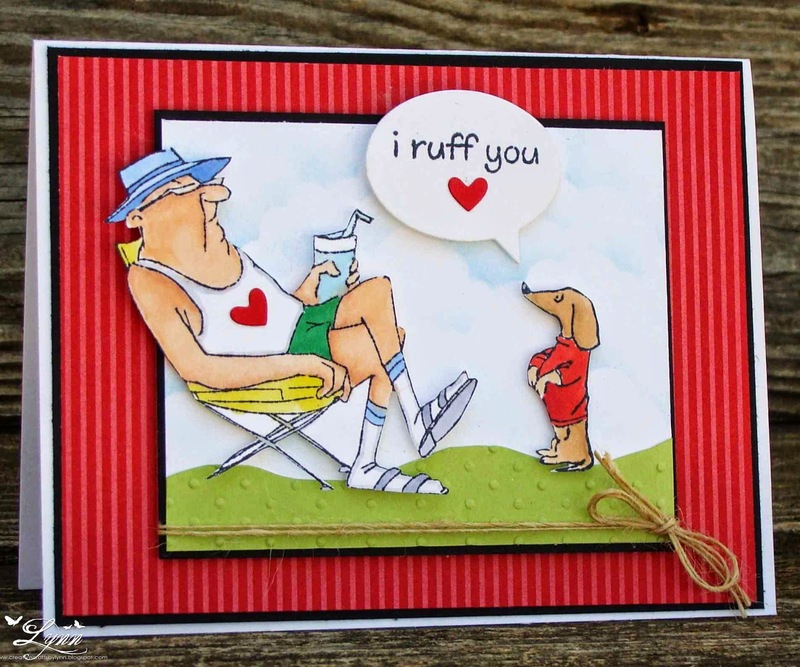 I thought it was time once again for Rambo (our little doxie) to give Jim a card. He likes to do that ever so often just to let him know he loves him. The main question though is - who loves who more! That's probably a toss up question around here. This is one of the Art Impressions stamps that's being sold by Michael's. As soon as I saw that little pup I knew I had to have it. He's just too cute - in fact, the entire set is CUTE! I kept this super clean and simple as always. 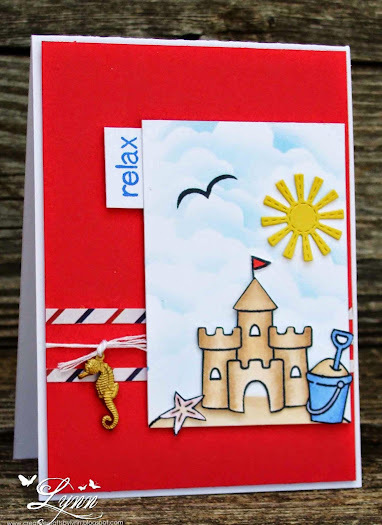 I stamped the image, cut it out, added a little glossy accents, and popped it up after sponging the clouds and embossing the "grass". The sentiment is from a Lawn Fawn stamp set. 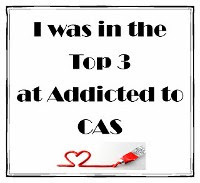 The hearts were die cut and then added to the sentiment bubble and the guys shirt. Jim doesn't like a lot of fluff and stuff on cards so he should be happy with this one.....not that I do all the fluff and stuff anyway! 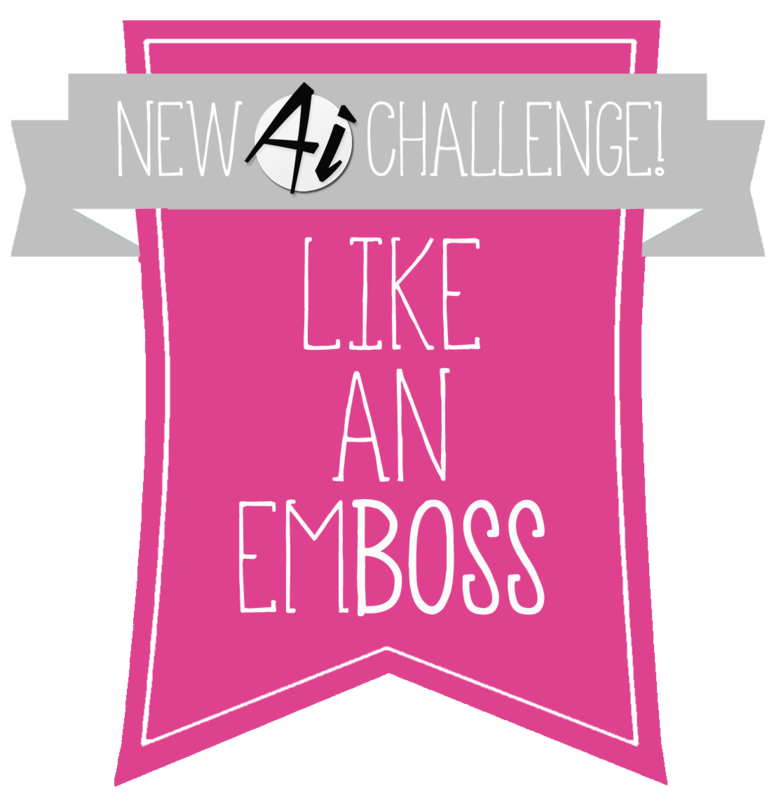 I'll enter this in the challenge at Art Impressions - Embossing! The end of summer is fast approaching.........well, not around here I don't think since it's still so hot. But it really would be nice to get to the beach and build a sandcastle or two. Since I'm not headed to the beach - and really don't like all that sand down my pants (LOL! )- I built one on a card! I used the sketch from Sketch Saturday and will also enter this in their challenge. It's a great sketch and one that I'll be using over and over. 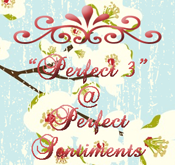 I used a set from Lawn Fawn for the images and sentiment. 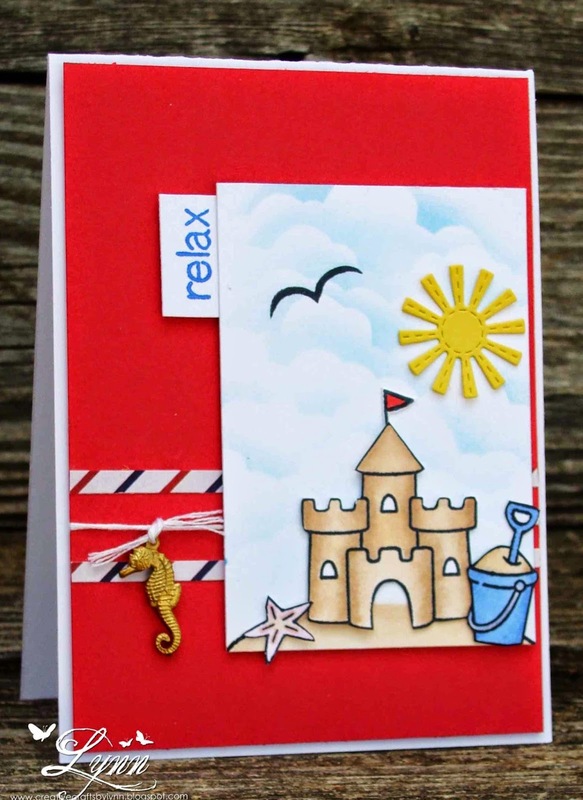 The sun die is from Lil Inker and the seahorse appeared my embellishment box. One of these days I'm really going to figure out where all this stuff comes from. Surely I couldn't be buying it all! At least that's what I keep telling my husband! 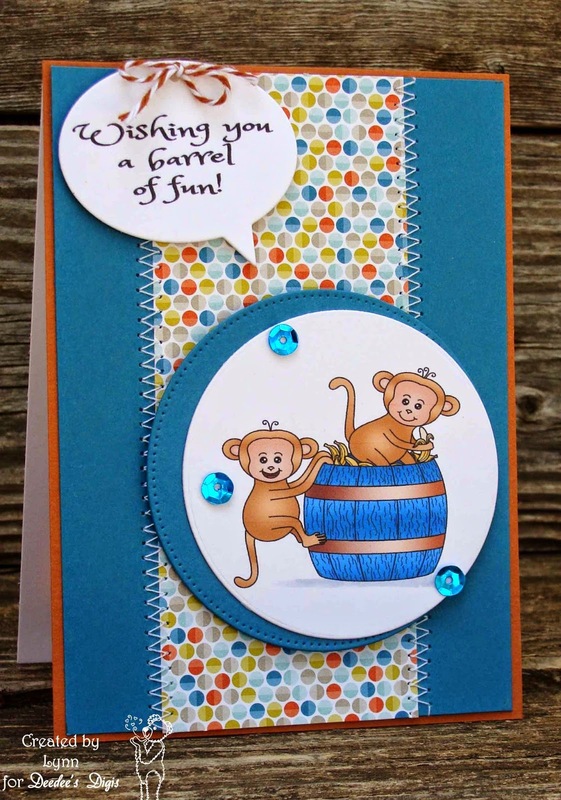 .....and we'll have a barrel of fun! Now you're going to be singing that all day long! Um......I really think that was a totally different kind of barrel in the song though! This little barrel of fun is from Deedee's Digis. It's one of the pre-colored images in the set and somehow I have about three (or maybe more) colors of blue in there. I'm trying to use up some of my card stock that has no name - but when I laid all this out, all the blues matched......maybe I need a new light fixture! 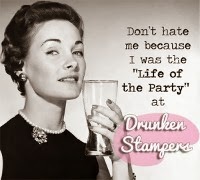 Anyway.....as I said, the image - and also the sentiment - are from Deedee's. 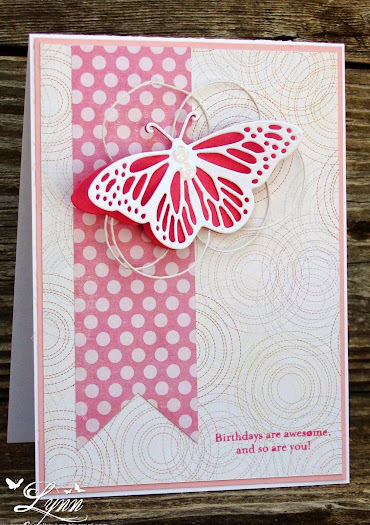 The patterned paper is from SU and the card stock from who knows where. When you get this set from Deedee's, it also has the colored images, line images........and the digi paper (which I didn't remember to use until I'd already finished the card!!!!) Sequins! You're going to be seeing some of those on my cards now too as I'm trying to see if I can at least make a dent in all the ones I have. 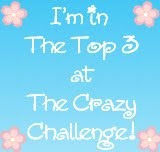 Now, all about that fun I was telling you about........be sure and check out Deedee's challenge, blog and store! I know this is long but so worth reading. Hint: There's a freebie involved here too! Twist #1 -- FREE-FOR-ALL! 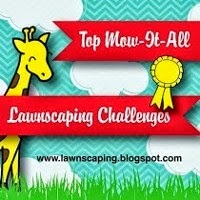 This month is a FREE-FOR-ALL challenge! As you can see, the featured set is "Monkey Business," and while last month's players received the whole set, we're offering the dingle monkey image from the set to anyone else who would like to join in. When you make and link up a project using our Digi of the Month, you get the next month's featured set for free! 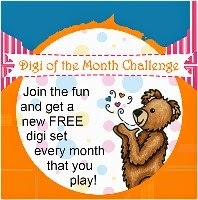 This is a great chance to join in and start collecting new, FREE digis each month! 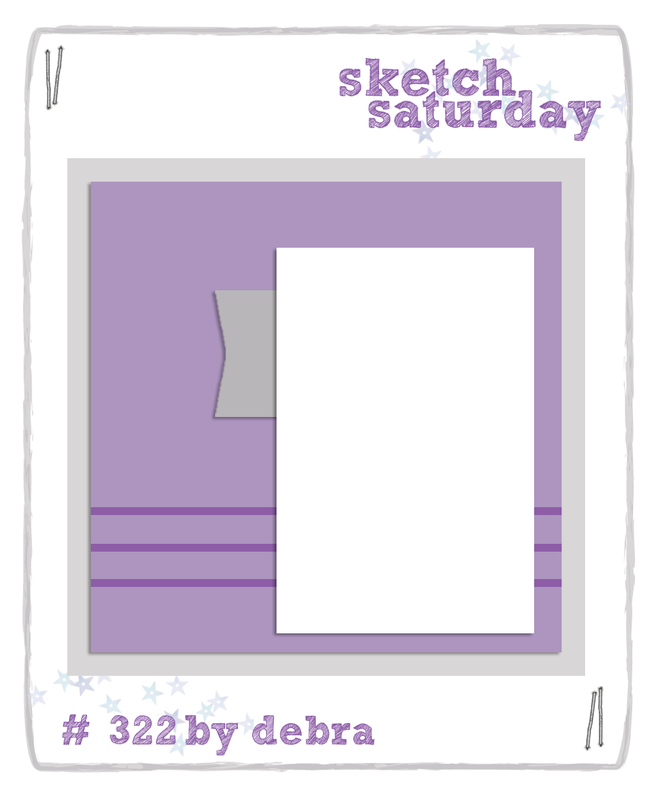 To download the freebie from the set for this month only, go to the Deedee's Digi challenge blog here and download it from there. Each Monday throughout this challenge, we will select one winner by random draw from our challenge participants to-date. The winner of each weekly draw will receive their choice of any one digi set from our shop. 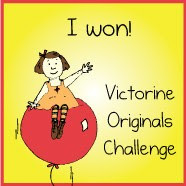 (Limit: one weekly win per challenge participant. 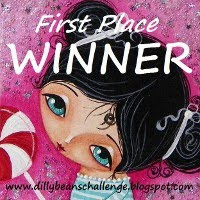 All participants up to the date of each drawing will be included, unless they have already won.) Then, at the end of the month, we will choose one Grand Prize winner who will receive their choice of any five digi sets from our shop. All participants from throughout the month, including our weekly winners, will be entered for the Grand Prize draw. 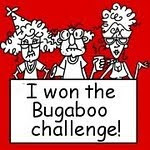 You can enter more than once, but each entry must be a separate share on your blog or gallery, please, and it must use a Deedee's Digi. So, that's it for today! 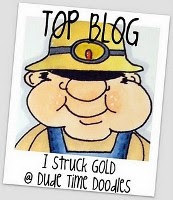 Thanks so much for stopping by.....and check out Deedee's Digis and play along with us this month. 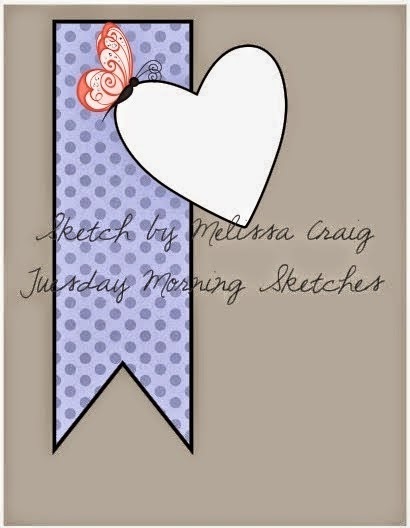 After doing all the shower invitations I finally seem to have a little bit of energy and desire to make a card again. Whew! Not much, but it's a start anyway. 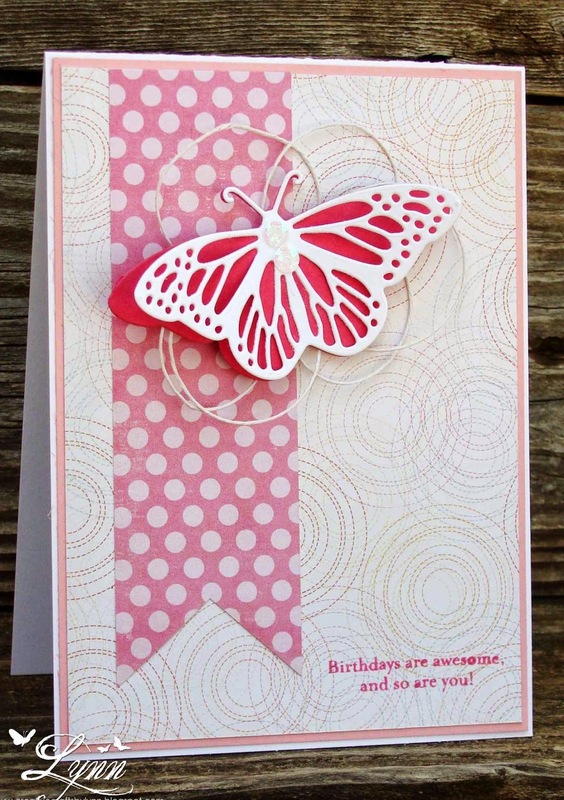 Using some patterned paper from DCWV and My Minds Eye, butterfly die from Impression Obsession, sentiment from Simon Says Stamp, a couple of sequins, and some twine I created this simple card for a birthday. The sentiment was pretty tiny compared to the rest of the card but I used it anyway because I liked it - in other words, because I wanted to! The sketch I used is from Tuesday Morning Sketches and I dearly love it! Just my speed! I'll enter this in their challenge. 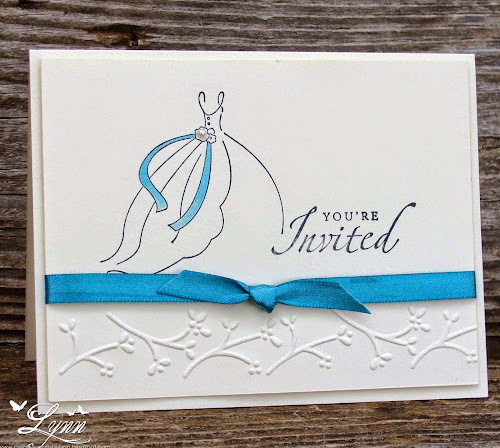 In case you missed me telling you about this......several weeks ago my sister in law asked if I could make her about 25 or 30 invitations for a bridal shower she was hosting. 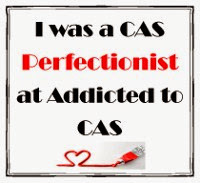 I hemmed and hawed for a while and finally gave in and said I would. Not a problem at all (smile).......then the next week she called and said she was wrong about the number of invites and she was going to need 50 of them instead! When I picked my jaw up off the floor I decided I'd better get busy and in a hurry. Even though they're very clean and simple, it still took me several days to get them completed. This HAD to be the MOST boring thing I've ever done in my life! 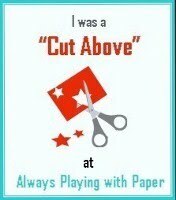 I'll NEVER, EVER, NEVER do something like that again ( unless I start charging about $10.00 per card! LOL!) Just extremely boring all the way around! I used the Blissful Bride image from SU. The sentiment is also from SU but I don't remember which set it was in. 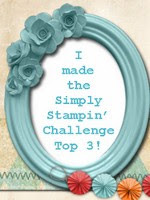 I embossed the bottom portion, stamped the image and sentiment, colored the sash, added Wink of Stella, popped on the pearl, and then tied the ribbon. All of this was done on cream colored card stock. All the information regarding the shower was typed and then inserted inside the card. Sounds easy and they really would have been - IF there had only been one! Just way too many cards doing the same thing over and over and over again - and trying to get them all look as close to perfect as I could get. We're starting another challenge at Tuesday Throwdown this week and our theme is Mello Yellow! Our sponsor is Robyn's Fetish, who also provided the DT with all the images. 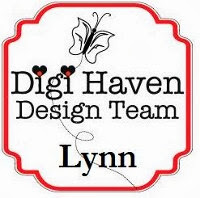 Come on over and join in on the challenge for your chance to win a wonderful prize package from Robyn's Fetish and also see the fabulous creations by the design team. I used this big bold sunflower from Robyn's Fetish for my card and moved leaves around on this until I was blue in the face! I printed out the image a couple of times, colored it in Copics, and then separated the leaves from the flower. No matter where I put the leaves then they looked a little wonky. 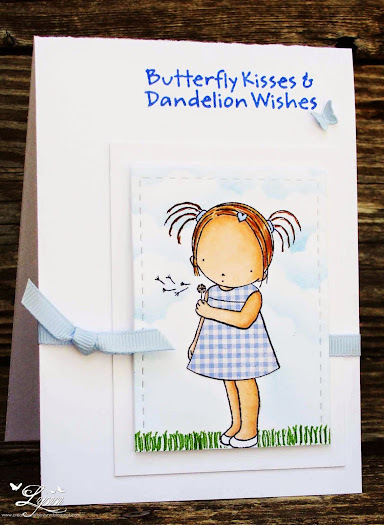 The background paper is from Doodle Bug Design and the sentiment was in a Simon Says Stamp kit. I mounted the sentiment on a strip of burlap and then added the twine. UPDATE on the bridal shower invitations! Believe it or not, I finally finished all of them - and never want to see another one as long as I live! Mass production is not my cup of tea I don't guess. Too boring! I'll post a picture of one of the cards tomorrow. 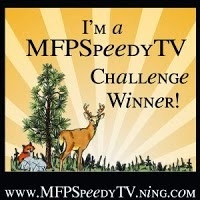 Thanks for stopping by.........and be sure and check out Tuesday Throwdown this week and enter our challenge.